Sometimes when I’m feeling mellow I can’t help but reflect on the good moments in my life, on the things that make my heart sing. Being an actor, and a patron of the arts, theater is high among the list of things that energize my existence. And there is a performing arts company in town called Mo’olelo (story in Hawaiian) that is dedicated to staging dramas that inspire us, no matter our ethnicity or creed or what we believe, to seek and embrace ways to respect each other for who we all are: human beings. They are dedicated to such ideals in every play, going about it in a community-focused, socially-conscious way, seeking always to provide significant roles for actors of color and to allow the company to serve communities that are traditionally under-served in American theater. I especially appreciate that they visit classrooms to ignite students’ imaginations and prepare them for theater-going experiences before they see the plays. That’s walking the talk to me. 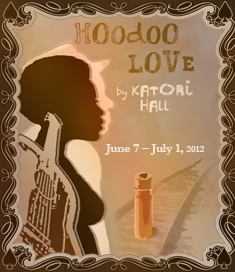 They’ve got a doozy of a human story to tell soon: Hoodoo Love, a play that’s infused with blues music. I got to sit in on the session when the actors first met and read the play and theater goers are in for a treat. This work of art by Katori Hall, according to Seema Sueko, Executive Artistic Director and Producer of the play, is an achingly human folktale in the tradition of Zora Neale Hurston. It vividly captures the rhythms and emotions inherent in the history of the time, the Great Depression, in Memphis, Tennessee, the playwright’s home city, through a deeply intimate and personal story of love, jealousy and magic. Based on what I heard that night this story teller can really weave a tale and that hasn’t gone unnoticed in that she’s the first Black American woman to win the highest honor in British Theatre, the Olivier Award for Best New Play. Her drama was originally produced at The Cherry Lane Theatre in New York in 2007 and it takes an audience into the world of Toulou, a young woman who has escaped her family and the Delta cotton fields to pursue her dream of becoming a Blues singer. She falls for Ace of Spades, a rambling blues man, and whips up a potion of hoodoo magic to win his love. But when her past catches up with her in the form of her brother, Jib, the magic backfires and she has to fight her way to a new path to her dream. How human. Don’t we all have to redirect our paths, every now and then, to what we most desire in the world? The actors are more than up for the task of taking us on this journey: San Diego’s own own award-winning actor and Executive Director of Common Ground Theatre, Monique Gaffney, portrays the CandyLady, the Hoodoo Madame of Beale Street; Jasmine Hughes takes on the role of Toulou; Broadway veteran Stu James plays the notorious Ace of Spades; Kirkady Myers breathes life into Toulou’s born -again Christian missionary brother, Jib. Nataki Garrett, Associate Dean of the School of Theater at California Institute of the Arts and Co-Artistic Director of Blank-the-Dog Productions in Los Angeles will direct the play. I feel mellow just thinking how grand it would be if, particularly, people who haven’t experienced a Mo’olelo play dropped in to see this talented ensemble weave their magic on stage. I just know they’ll walk away, as I have from the plays of theirs I’ve seen, feeling that they’re contributing to a positive force in our community, a theater company dedicated to bringing our diverse communities together so we can learn from each other. The very entertaining of such thoughts makes my heart sing. Thank you so much, Ernie, for this great article! Working for the San Diego Restorative Justice Mediation Program, I had an opportunity to be closely associated with the Mo’oleo theatre group in the past. Seema helped to promote the organization through one of the productions several years ago. I continue to receive periodic updates from Seema, and should my life ever settle down enough, I would enjoy returning to the Mo’olelo theatre. It reminded me of the theatres I attending on another island many years; small, intimate, and relevant. So small, so intimate, so relevant. Exactly the kind of local news and information we need more of, Ernie………at the San Diego Free Press! Thanks for the comments; that gives me something to think about. I’m looking forward to seeing the show! Me too. I’m going on the Chocolate Voice night.